I’ve been thinking about it countless time and never done one but this weekend, without any preparation, I just thought I give it a shot and this is the result.. so please have mercy with me hehe..
Look forward to hearing your feedback!! If you are interested in our upcoming Mindful Birth workshop in Malta on 24 June 2017 please check out our Mindful Mum Facebook page for further info. Oups, this month I’m a little late for my monthly new mummy recap… sorry! But hey – it’s only a week since our little sunshine has turned 6 months, and now that I’m sitting down reflecting I can only say: what an exciting first half year it has been. With quite a lot of changes lately… Our nights which were usually quite chilled out (Zoe only woke up once for a quick feed, if even) turned into very interrupted sleep, Zoe was sick for the first time, we therefore called off our holiday, I got sick myself and looked after a sick baby for the first time (all natural with homeopathic remedies and lots of TLC) and just recently she’s sitting in highchair and – I can’t believe that I’m writing this: we finally started her with solids! Ohhhh how hilarious her face expressions were to look at!!! So easy, yummy and healthy! As you know I mostly post about my healthy cooking adventures on my nadisunshine FB page and Instagram several times a week (check it out for inspiration if you aren’t following me yet 🙂 ). The soup star of the month was definitely my curried cauliflower soup and I promised to post the recipe here on the blog, so here you go! It’s super easy, very tasty and the ingredients are sooo good for you. Cauliflower, just like its siblings broccoli, turnip greens, cabbage and kale, is a cruciferous veggie with tons of health benefits. It’s boasting with vitamin C (amongst many other vitamins and minerals) and is known for it’s anti-inflammatory, cancer fighting, heart boosting benefits and is great for digestion. It’s available locally and on top of that very inexpensive. Paired with curry, turmeric and ginger which are all well known for being great for the immune system (more info here and here as well as my recipe for a Flu Fighter Turmeric Drink which I posted in the past) this soup is not only yummy but an absolute boost for your body and health. Heat up the oil in a pot and fry chopped onion, garlic and ginger on medium heat. Add the chopped cauliflower and dust with the spices. Now cover with stock and let it cook gently until it’s soft (20-30min). If you decided to make the soup creamier with a potato also add it with the cauliflower. If you decide for the dairy free milk add it rather towards the end of the cooking time. Purée the soup with your hand blender. You can either make it very smooth or keep it a bit chunky which is nice, too. Careful when you blend the soup, the yellow of the curry/tumeric makes bad stains ;). Finish with salt and pepper to your taste. If you opted for chili, add it with the other spices in the very beginning. P.S. I want to dedicate this recipe to my friends P and R from Vienna who were brave enough to quit their jobs and set up their own company for super foods in Germany, Austria and Italy. Guys – you rock and are an inspiration! If you want to check out their Facebook page (in German only) go and check out Green Panda – Superfoods with love. I wish you all the best of luck with it!! Ok, good intentions are here to stay, so I’ll take my feedback seriously and try to post as much as I can. Today was a good day. Cause I stayed on track and it started really well. How? Easy! Start your day with an alkalizing, detoxifying juice! This juice only needs some basic ingredients. Beets, carrots and ginger are peeled quickly, grab some of your greens in the fridge and off you go. Hint: I always wash all my greens and herbs immediately after I bought them and store them in airtight containers. That keeps them fresh longer and it’s super convenient just to take what you want out of your box ready to use it. 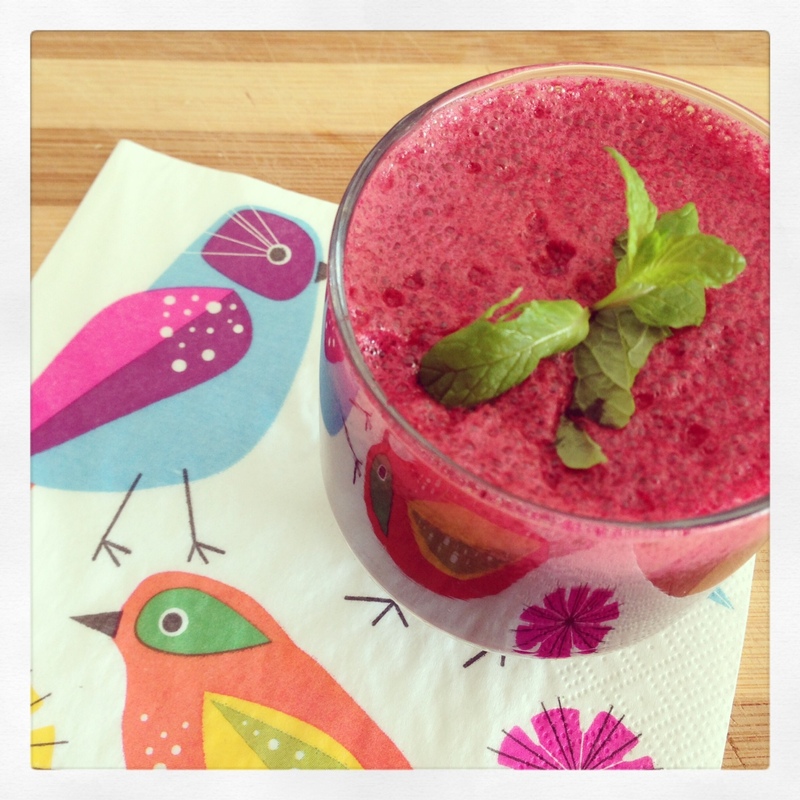 Btw: beets, carrots and ginger are all alkalizing, cleansing and encourage detoxing. Ginger is also used often to improve circulation (Hello fellow office workers! ), antispasmodic (Don’t we need it all sometimes?) and anti-nauses which is great if you are sensitive and go on a trip on a sailing boat (get yourself a flask of home-made ginger tea next time). Juice the beets and carrots in your juicer. I’m quite okay with my cheap one but in the long run I’m sure it would be better to invest in a good one as you get more juice and less pulp. Then I add the juice to the greens, bit of oil and the super foods in my blender, add some water and mix it thoroughly. By the way, I’m still looking for a nice way how to re-use the pulp, – ideas anyone??? The first days were pretty awkward. The green smoothies in the morning were the easiest, you mix different greens with 1 apple and water, that’s it. If you like you can add cucumber, celery sticks and one day I tried to make my own almond milk out of soaked almonds and water. But the rest of the day turned out to be a bit more difficult. Lots of the stuff needs soaking so you have to plan ahead. No good for people who work from home like me and normally just go to the fridge when they get hungry! However, some of the grains came out nicely, some less (my amaranth with fresh spinach more looked like baby food) but I survived and felt tiny steps of improvement and broke myself more into the new way of cooking. When it comes to recipes I only wanna share one thing with you this week, an amazing, super yummy salad and it’s totally alkaline and fits the diet perfectly. More photos of my experiments in the photo gallery below. Steam the veggies shortly so they still keep a crunch (apart from the sweet potatoes, they may be a bit soft), put coconut oil on top and sprinkle with seasalt when they are done and hot. Let them cool off. Prepare the plates with your lettuces and spread them nicely. Add the dressing. Arrange the steamed veg. Drizzle with some additional olive oil. Sprinkle if you like – I used shelled hempseed and crushed whole hempseeds which are a vital source of fatty acids, fibre and protein. P.S. If you are interested in seeing a list with alkaline – acidic foods, I am using the list on The PHMiracle website, developed by Dr. Young the kind of guru when it comes to the alkaline diet. Another website I really liked is Energiseforlife.com where a young guy called Ross takes it further with a bit of a younger, fresher approach. Okay. We had the savory crumble experiment with cauliflower. 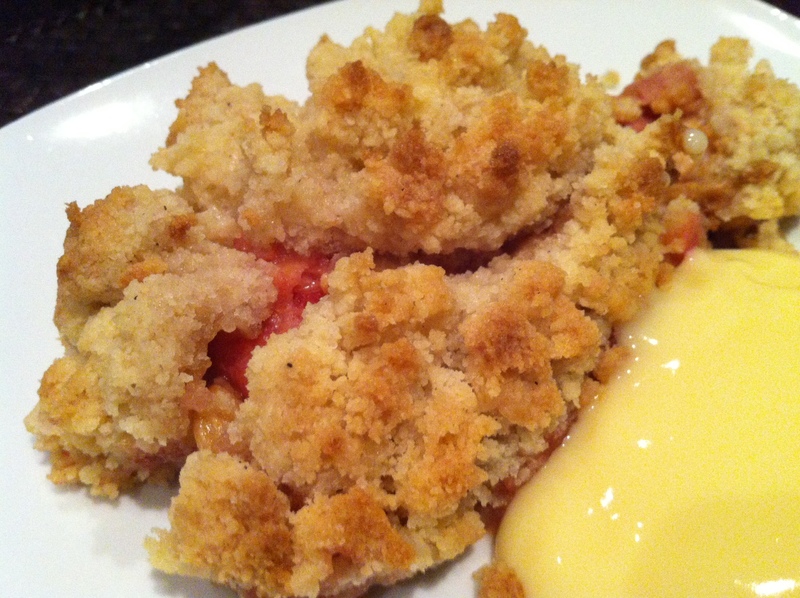 Still, nothing tops a classic, sweet and soft crumble when we crave for comfort food. And as Napoleon Bonapartes once said “”The way to a man’s heart goes through his stomach” I would freely interprete to “yummy food just makes you feel better” 😀 As I really wanted to cheer up a friend in need, I knew there is only one way: fulfill his long desired wish for a rhubarb crumble. No sooner said than done! For the crumble: 200g of flower, 100g of sugar, 125g of butter (room temperature, cut in little pieces, some cinnamon, a tiny pinch of salt. For the rhubarb: big bunch of rhubarb, a bit of water, a thumb sized piece of fresh ginger (finely chopped), a ground cardamom capsule, a tiny shot of natural vanilla essence, some agave sirup (depending on your taste of sweetness), a dash of lemon juice. Preheat the oven to 170°C. Mix all the crumble ingredients until everything blends and creates the crumble. For the rhubarb put all the ingredients in a small pot and let it simmer for like 5min. Pour of the juices with a sieve and keep the rhubarb which soaked up all the nice flavors. Put it in an ovenproof dish an top up with the crumble mix. Bake for approx. 30min and serve with soy vanilla pudding. YUUUUUUMMMMMMMM!! !